Once you find out what the famous fast food chicken nuggets are made of, most people turn up their noses in disgust. However, that doesn’t mean you won’t miss their crunchy chewy texture, nor does it mean that you won’t ever again wish you could have something at least similar. Just call me Genie Deb, cause your wish has been granted. Flavorful, crispy, juicy with a bit of a kick, these 100% meat-free “chicken nuggets” get the job done. Children and adults alike enjoy them with a variety of sauces. We served our vegan chicken nuggets with Thai sweet chili sauce, Sriracha hot pepper sauce, ranch dressing, and of course barbecue sauce. Everyone in the household loved them – even the meat eaters. 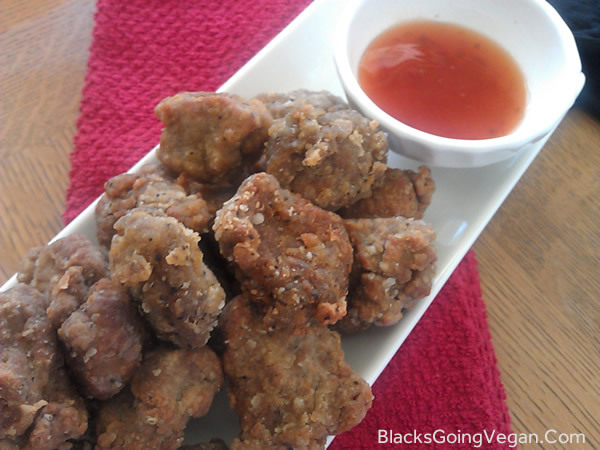 The recipe makes quite a few vegan chicken nuggets, so you should have enough for a crowd with the single recipe, but it’s very easy to double or even triple for large events. 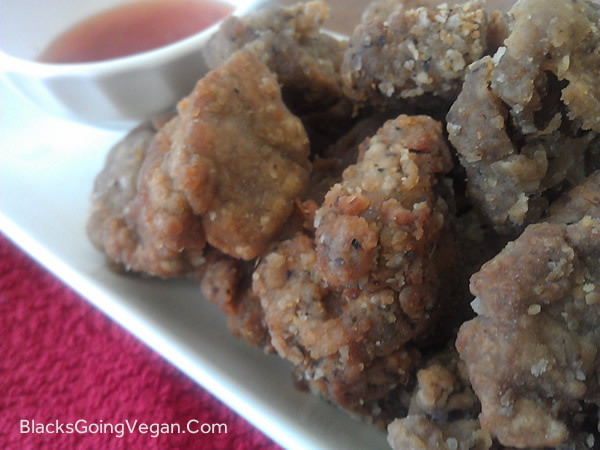 If you’ve never made seitan before you may find the experience a bit intimidating. Follow the instructions to the letter and you should get great results for your vegan chicken nuggets. Feel free to adjust the amount of red pepper used to suit your taste buds. We like spicy food around here, and use the full amount called for plus a few extra shakes for good measure. A delicious animal free version of a fast food favorite that has no mysterious ingredients, and will win the hearts of adults and children alike. Next game night gathering, try these with a variety of sauces for dipping like mustard, ranch dressing, Thai sweet chili sauce, barbecue sauce or hot sauce. In a small bowl, combine 1-3/4 cups water and tamari or liquid aminos, set aside. In a large bowl, combine the dry ingredients and mix well with a TOTALLY DRY whisk or fork. Make a hole in the center of the dry ingredients and pour in the wet ingredients all at once. With a large sturdy spatula, stir swiftly to incorporate all the dry ingredients. Dig in with your hands to finish incorporating dry ingredients then dump mixture out onto cutting board or countertop. Knead like bread dough for about five minutes, then let dough rest for about 15 minutes. Cut (with shears or sharp knife) into pieces about ¼" thick and whatever size you prefer (chunks or strips or squares). Add water, vegetable cubes, cut onion and peanut butter to a large heavy pot. Turn heat to medium-low. While broth heats, prepare the seitan. Once simmering broth has reached boiling temperature, reduce heat to low and add your seitan pieces. You want to have heat low enough that you avoid boiling the seitan - just a nice steady simmer. Cover with pot and simmer seitan for 35-40 minutes (do not overcook). 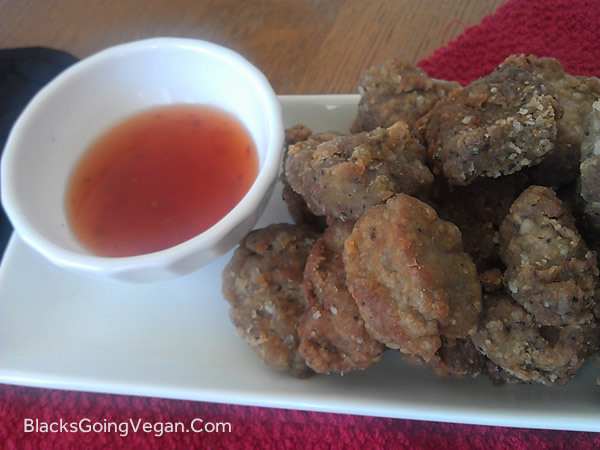 When done, remove seitan to a colander and allow to drain. Prepare your coating as you would for fried chicken but slightly lighter in amount. I use about 1-1/2 cups of flour, and ½ cup of cornstarch or tempura flour, a bit of seasoning salt, black pepper, paprika, and onion powder - but whatever you prefer is fine. Dump that into a large plastic bag and shake to mix well. Heat frying pan with a high smoke point oil like peanut or grapeseed oil. Add chick'n nuggets a few pieces at a time to the seasoned flour mixture and coat well. Place in hot oil and fry until coating is brown and crispy. Remove from pan and place on cooling rack to drain. Serve hot with dipping sauces of your choice. 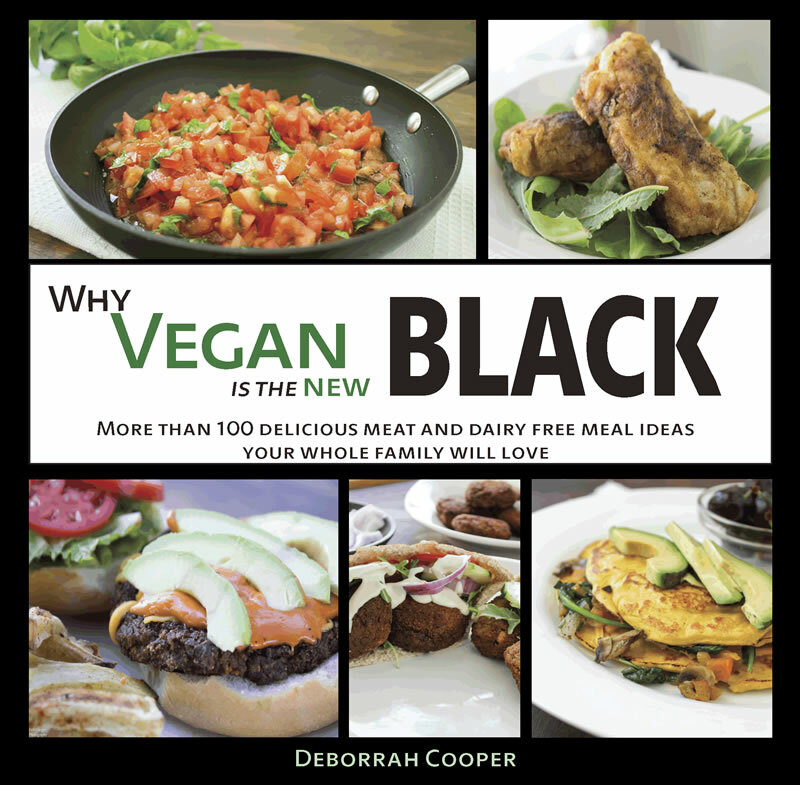 For more great recipes, check out WHY VEGAN IS THE NEW BLACK: More than 100 Meat and Dairy Free Meal Ideas Your Whole Family Will Love. Check out this new show which examines racial stereotypes – one of which is that ALL black people like fried chicken. What, like nobody else likes fried chicken? No white or Asian or Latino people like fried chicken? Please. Fried chicken is like the national dish of the world. That is why vegans need their own version of it!